Turnov has been a restful break for us. We’re staying on a “farm” that belongs to a couple from Prague that wanted to move out to the country with their 2 kids. They have a compound with 3 buildings, one of which is ours for the week – nice and spacious. Aidan and Willem have had fun playing with their cats and in the fields and forest adjoining the property. We’ve eaten in more often here than we have in the cities we’ve stayed, giving us some respite from restaurant food. [I’m sticking with my “no wheat” diet, which may or may not be accomplishing anything, but has definitely cut into the food repertoire — too much sausage and not enough pasta for me]. The slower pace of the farm area has been refreshing for the family. I’ve got the boys reading George Orwell (Aidan – 1984, Willem – Animal Farm), to give them some perspective on totalitarianism, which has played such a prominent role in Czech history. We also have had them researching some of the places we’re visiting on the Internet (loving that Wikipedia), and note that they seem to get more out of it after they’ve visited than reading about it before. 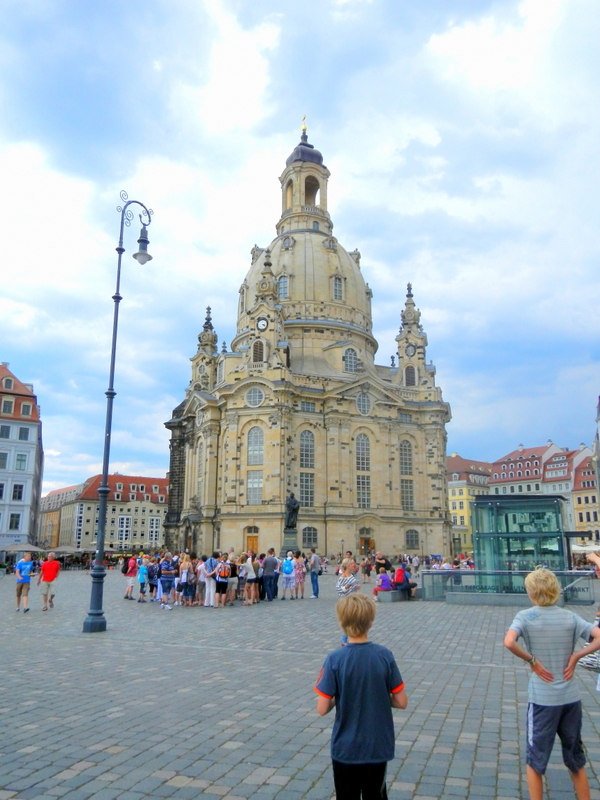 Dresden was one good example of that; Aidan enjoyed reading the Wikipedia information on the Dresden Frauenkirche (below). In the last two days we’ve had a couple of dramatic thunderstorms, with lightning flashing horizontally across the sky as we drove back from Dresden at night. The kids got caught in a shower yesterday which created a lake on our back patio, and they had a blast. Have seen a couple of frogs who probably don’t mind all the water. The owners of our house explained that power outages were common during storms, but so far we haven’t lost power due to thunderstorms. It was out one whole day for scheduled maintenance. Figuring out our new GPS, purchased in Prague, has been a bit challenging, but it has been extremely helpful now that it’s working properly. Now the only problem is the driver who seems to have a special skill for missing exits despite clearly articulated directions by the tiny lady in our GPS (maybe its because of her British accent). However, we were able to find our way to and from Dresden, and several restaurants and a grocery store in Turnov, that would have been challenging without the GPS. Also, most speed limits in the Czech Republic are not marked (e.g., max speeds change when you enter or exit city limits which are noted with a sign with the town name), so the reminders from the GPS help keep us from getting a ticket. The GPS has taken us on what seems to be the most complicated routes possible through rural Czech Republic, so I can’t say that I’ve fallen in love with it (her?) yet. On the “business side” of things – our house sale closed in late July, so that removed a bit of uncertainty and the State of Washington has approved my new advisory business. [Note to those who don’t know about this – I set up a new investment advisor to allow me to continue advising one family while I travel; I am precluded from working with other clients due to a non-compete with my former employer. I worked with a Seattle-area consultant who did most of the set-up work, but had to have a couple of discussions with regulators with the State while traveling; I’m finally “live.”] Based on our travels, I already see the benefit of seeing the world to get a broader perspective on investing, and I am finding that my cynicism with the capital markets and TPTB (the powers that be) keeps growing with every day: HFT algos going berserk, central banks implicated in LIBOR fixing, non-farm payroll numbers being fudged? Maybe I should just quit reading Zero Hedge. Not all self-catering rentals are created equal. In a couple of places, we’ve had everything we could possibly need, in others there’s no salt and pepper (we’ve been bringing some along) and a limited supply of toilet paper and pots and pans. Some come with soap and detergents for dishwashers and washing machines and others don’t. Coffee makers have also been a bit hit or miss. Since we have a car currently (driving from Prague to Turnov to Krakow to Budapest), we can carry some supplies with us now, but we will need to abandon some of the harder to transport supplies as we move from place to place, requiring a trip to the store soon after arriving at our next stop. Managing our electronics seems ridiculously complicated. We’ve got iPads, iPods, laptops, cell phones, Kindles, digital cameras and now a GPS. Keeping things charged seems to require too much effort and constant juggling of our adapters (thanks to Marta for the iDevice chargers – these have been very useful). However, I don’t regret bringing them along – the various electronics have been handy for keeping us in touch, for homework, and recording memories of our trip… oh, and entertainment. I’ve figured out how to stream Netflix to Europe (using an anonymous proxy service), so the kids can watch some videos, and we’ve made good use of the Seattle and KC Library audio book and ebook selections. Still using Amazon and Audible for digital items we can’t get from the library. Phone-wise, mostly relying on Skpe (requires WiFi connection) since we are not in once place long enough to justify getting a local SIM card – so far. Anyhow, still learning how to make everything work (and keep everyone happy).